Have you searching hair ornament Yiwu? The products in Yiwu Hair Ornament Market would be found there such as comb, headband, hairpin, artificial hair, wigs and so on. They are made in different materials with various designs. Location: 2nd Floor, District 1 of International Trade City. 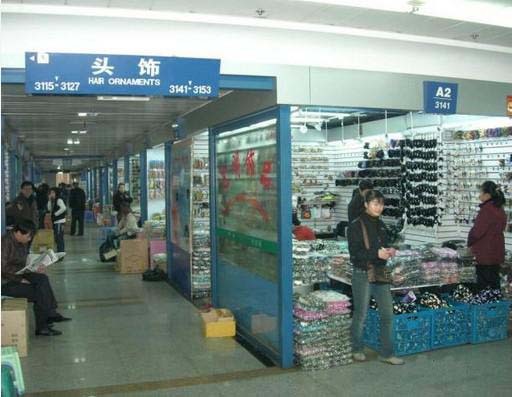 Yiwu Hair Ornament Market, on the 2nd floor in Futian Market phase 1, is closed to the Yiwu Jewelry market. The products in Yiwu Hair Ornament Market would be found there such as comb, headband, hairpin, artificial hair, wigs and so on. They are made in different materials with various designs. So it is a great tour for you to have a visit. We ensure that you can find what exactly you need. Maybe you think it is easy to get a sample from shops, because you find there are so many samples there. But it turns out not to be like that way. Samples are always for displaying, not for selling. Luckily, a few shoppers will offer free sample for you, and you also can buy something you like from them. However, they prefer you buy a sample first and then deduct this fee from your future orders. And if you place an order in spots, it is a certain that you can be offered a sample if you want. There are retails of course. The minimum quantity for retail is a dozen, not a piece, even though many customers expect that. Price has a range from cents to hundreds dollars according materials and popularity. In this area, you can find a lots dollar items. As we mentioned, it is not easy to get full information about the products from the sellers. Don’t worry about that. What we can do is to help you out of that situation. Further more, we are not just your interpreter but also an assistant to deal with all the business before you receive your products at home. We would accompany you to market to pick up products you like, and place orders you want, track the products all the time until commodities reach you safely. We promise we would offer the first rate service to you. Welcome to Yiwu! Welcome to Yiwu Amanda to purchasing Yiwu hair ornament!